Please browse the images of my current work. Each piece is carefully hand cut. After cutting the piece of glass, you then decide whether to wrap it in copper foil or wrap it in lead. Then you assemble the pieces like a puzzle and solder them together. Some are made with leaded solder and some with unleaded solder. After the piece is finished, you can choose to patina or not. Let me know what you think. I've placed a penny in each picture to help you determine the size of each piece. All pieces were placed out on my light table to give you an idea of what they look like with light shining through them. They are much more beautiful when natural sunlight hits them. Note: Double click any of the images to see a larger picture. This is the first angel that I made. While I was making her, the U.S. Navy Blue Angel's were flying over my house getting ready for the air show. I ran outside and could actually see the pilot in the plane. This angel took me days to create and then put together. I had trouble at first, then I asked the angels to guide me and it all fell into place. She is leaded stained glass. This flying angel was something just for fun. I have her hanging over my workstation while I make stained glass. I put her there to remind me to ask the angels for help while making other pieces. She is made by copper foil around each piece then soldered together. This colorful group of butterflies reminds me of how much I like butterflies and how things are constantly changing or as some know it, transitioning. This piece is leaded stained glass. I hang this in the window for Chakra Balancing. It is all the colors of the Chakras and when the sunlight flows through, it fills the room with the Reiki energy for balancing these energy centers. This piece is made with copper foil and then soldered together using no lead solder. I hang this in the window for Chakra Balancing. It is all the colors of the Chakras and when the sunlight hits, it fills the room with the Reiki energy for balancing these energy centers. 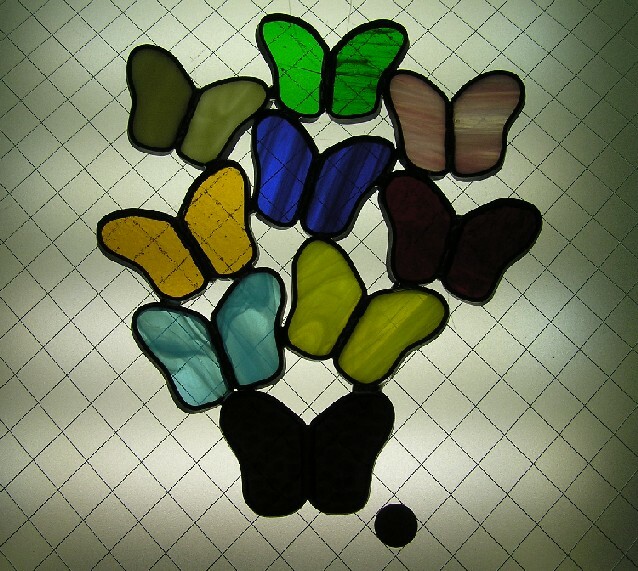 This particular piece is leaded stained glass. This piece is priceless. This piece is priceless. A similar one can be made for you for $55.00. I'm selling this piece for $85.00. I sell these for $45 each. Can be made in different sizes. Price will vary depending on size. I sell these for $45 each. 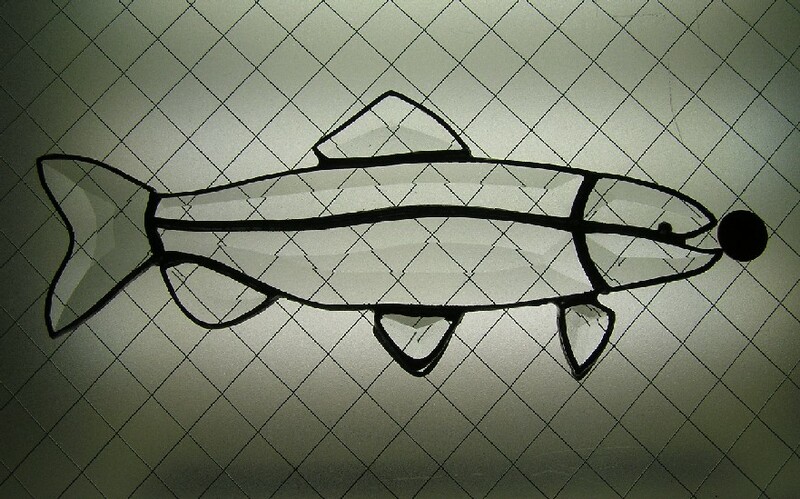 This is a beveled glass fish. I purchased it as a kit. When the light hits the bevels it produces a rainbow effect. It was copper foiled then soldered together. It can stand up on its own on a table. These yellow flower petals has a center that reminds me of the sun rise. It was copper foiled then soldered together. This is a purple tulip inside a blue and clear frame. It is copper foiled then soldered together. The outside edge is lead. This is a orange tulip inside a yellow and clear frame. It is copper foiled then soldered together. The outside edge is lead. This heart is red and milky white on the inside. It is a leaded stained glass piece. How do you see the white light growing in your heart? I'm selling this piece for $65.00. I'm selling this piece for $85.00. I'm selling this piece for $100.00. I'm selling this piece for $100.00. I'm selling this piece for $35.00. This heart is milky white and red on the inside. 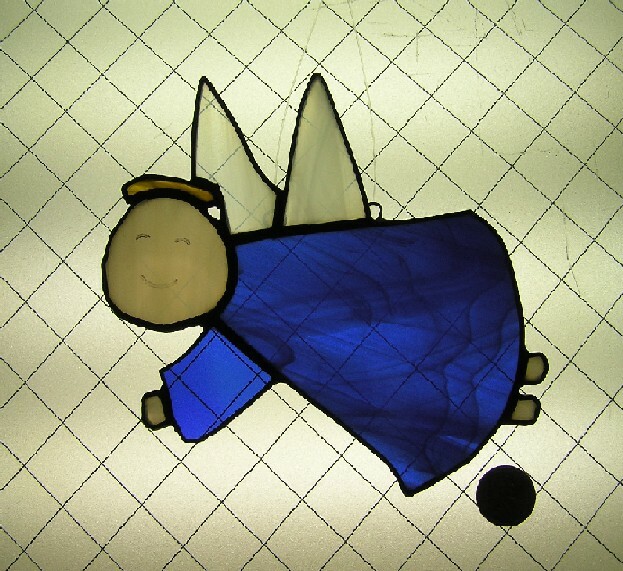 It is a leaded stained glass piece. This is a colorful rainbow with a cloud. It is copper foiled then soldered together. What colors do you see in your rainbow? 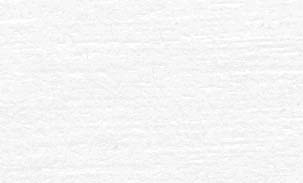 This is white flower with a burnt orange center. 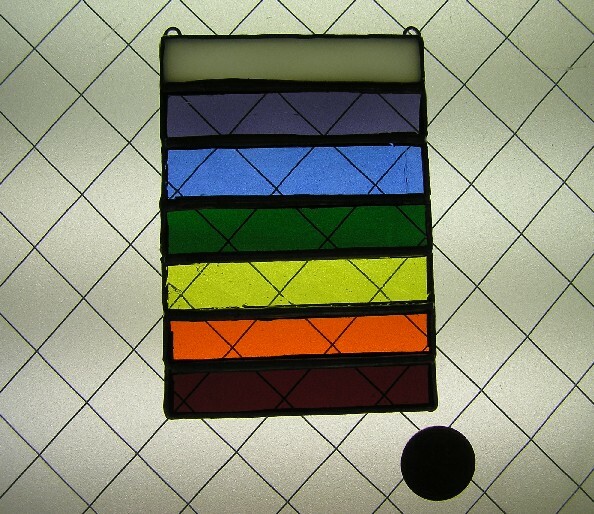 This is a leaded stained glass piece. This is made with a more solid pearlized glass (to create rainbow effect) in cream color which is cut to make up the flower petals with a teal blue center. This is a leaded stained glass piece. This butterfly is yellow with a clear body. 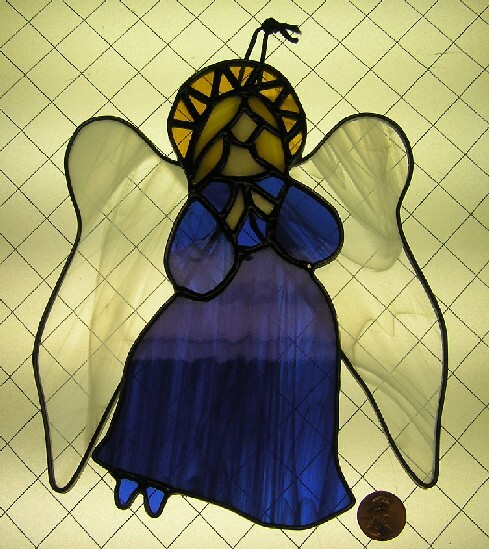 It is a handmade leaded stained glass piece. This butterfly can also be made by wrapping in copper foil. What color do you see your butterfly? I'm selling this piece for $35.00. I'm selling this piece for $45.00. I'm selling this piece for $85.00. I'm selling this piece for $85.00. I'm selling this piece for $45.00. This heart flag is copper foiled then soldered together. This is my idea for a frog. 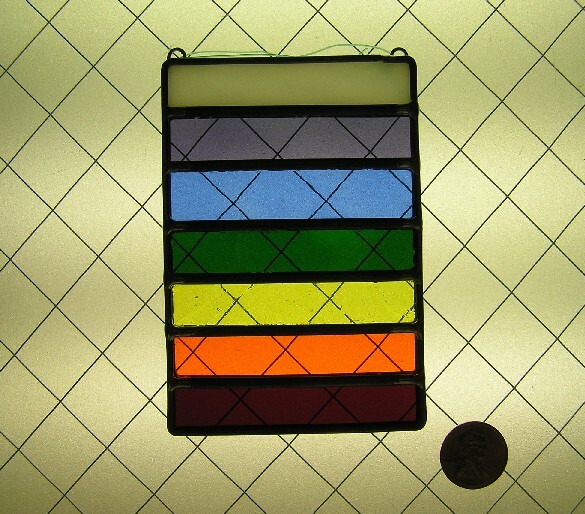 This is a leaded stained glass piece. This is my idea for a Christmas decoration. This is copper foiled then soldered together. This is my idea for a business card holder. This is copper foiled then soldered together. This is my idea for a candle holder. I've taken small pieces of glass and purchased shapes and put them together on this glass candle holder with grout. It's called Mosaic. I'm selling this piece for $85.00. I'm selling this piece for $55.00. I'm selling this piece for $45.00. I'll make a similar piece for $85.00. I'll make a similar piece for $55.00. This purple creative is a made up design showing colors and patterns that I enjoy. I think of Reiki when view this piece. This red creative is a made up design showing some colors on the Chakras. I feel grounded and warm with this piece. This blue creative is a made up design showing some colors on the Chakras. I feel peace and cool with this piece. This multi-color creative is a made up design showing some color that remind me of stained glass in a church. Thank you for your time. If you have any questions or would like to purchase any of items that are for sale on this page, please feel free to send me an email.